In connecting personal experience to much bigger cultural observations, the 12 essays collected in Little Boxes: 12 Writers on Television (Coffee House Press) transform the highbrow and lowbrow television of the 80s, 90s, and early 00s into an instrument through which we can examine ourselves and our culture. There are essays about the shows my friends and I grew up with, like Twin Peaks, The Cosby Show, Dawson’s Creek, and how these shows and others reveal our emotional connection to music, the pain of divorce and shattered ideals, the imagined demarcations between prettiness and intelligence, sexuality and identity. 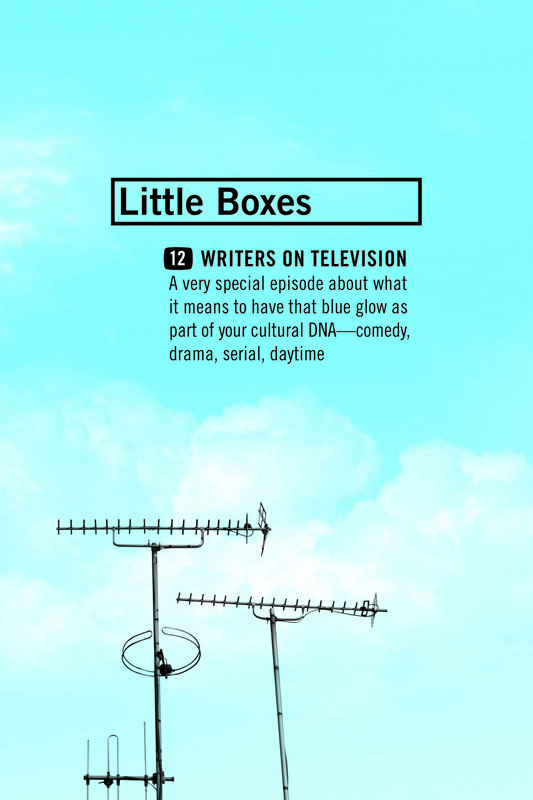 Little Boxes: Twelve Writers on Television, ed. Caroline Casey. Coffee House Press, August 2017. 208 pp. Days of Our Lives becomes, in Van Meter’s essay “The Hourglass,” a way to explore time and grief. Van Meter started watching the show with his grandmother when he was a child, and so has grown along with its characters – which means they’re real to him, despite their improbably tumultuous lives, and despite the barrier the television screen allegedly throws up between them. They’ve got regular jobs, like the people Van Meter knows, and they live in a town that seems familiar, almost like a memory. He remembers his grandmother catching him up on the gossip in Salem: “And so I understood, even as a child, that part of the point of watching a soap opera was that it was fleeting, almost as though it were a live performance. The stories were a thing we were chasing, and if we didn’t catch them, something would be lost.” He connects his experience to the experiences of other Americans, arguing that most people start watching daytime soap operas because someone in the house, usually older, is already a fan. For Van Meter, Days of Our Lives is a familial tradition handed down from grandmother to mother, from mother to son. The show is so powerful because it connects Van Meter to his grandmother even after she passed: to this day, he still finds himself watching the show in the kitchen, muttering “I hate Jennifer,” because that’s what his grandmother did, and because, like his grandmother, he really does hate Jennifer. Socially, already, we often find it comfortable to discuss and organize our understanding of our lives and relationships in terms of television. I don’t know whether it’s a good or bad thing, but it is a thing. And as long as any conversation between three or more adults can be sure to turn to television at some point, the essays in Little Boxes add some appreciable heat to the glow of the pale blue light coming from the foot of the bed, the living room wall mount, the recess above the Frigidaire.